DENVER — Just weeks after passengers suffered long delays, canceled flights and delayed or lost baggage due to weather and other factors for Frontier Airlines, passengers are still reporting problems. Video shot by passenger Ty Robben from Frontier Flight 265 out of Denver on Dec. 27, shows four baggage handlers purportedly arguing outside his plane. The flight, which he claimed was set to take off at 5:15, didn't take off until 5:56 p.m.
A Frontier Airlines spokesperson confirmed the flight had been delayed, noting 24 minutes of that flight's delays were due to a maintenance issue earlier in the day. He said 17 minutes of the delay were due to baggage loading. 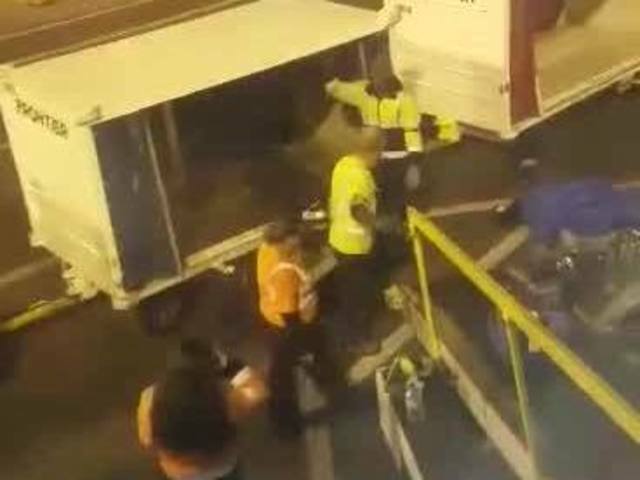 Baggage handlers in the video can be seen disagreeing with one another before parting ways. Robben said they didn't load bags until a pilot intervened. The Frontier Airlines spokesperson said they're uncertain as to whether or not the employees were disagreeing with one another and said the company is interviewing the baggage handlers to learn whether or not they engaged in inappropriate conduct. Frontier Airlines said they don't tolerate inappropriate conduct and will take further action if necessary.